I previously ordered these portion cups and they were aluminum. The new portion cups I received are plastic with a metallic appearance. Why is this packaging different? 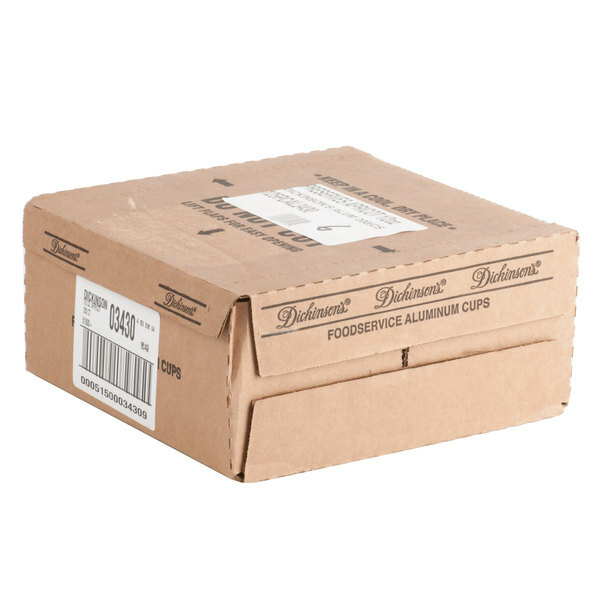 Dickinson's is discontinuing their aluminum portion cup and is transitioning to a new metalized plastic cup. Both feature similar eye-catching graphics. Compared to the aluminum cups, the plastic alternative is easier to open and reduces the number of dented cups. The metallic finish still provides a more upscale look than standard plastic portion cups. 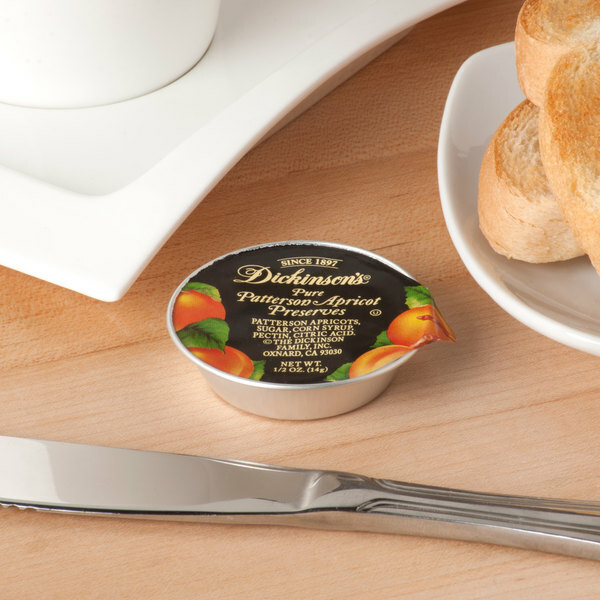 Indulge your guests with the full-bodied flavor and outstanding quality of Dickinson's pure Patterson apricot preserves. Since 1897, Dickinson's has been the leading American brand of gourmet preserves, syrups, and honey, with its "American Gourmet" character, premium varietal fruits, and pure, high-quality ingredients. Unlike jelly or jam, preserves like this one feature perfect pieces of flavorful fruit drenched in sweet syrup. These lush preserves burst with the mouth-watering taste of sweet, premium apricots. Featuring a light orange color, they make a delicious addition to exclusive breakfast services or in-room dining. This portioned .5 oz. cup is the perfect middle ground between economic plastic cups and sophisticated glass jars, while still presenting a chic appearance. The packaging of this product helps to maintain its delightfully fruity taste and preserve its superior quality. With its single serving size and elegant graphics, these high-quality apricot preserves complement the refined atmospheres of the world's finest restaurants, hotels, and catered events. Nice quality pure Patterson apricot preserves that are delicious. A great portion cup for easy serving. The preserves are excellent and our top requested flavor. The preserves are excellent, among the best I have tasted. The ingredients and packaging are high quality, and the price, while not exactly low, is actually not that bad for such a premium product. 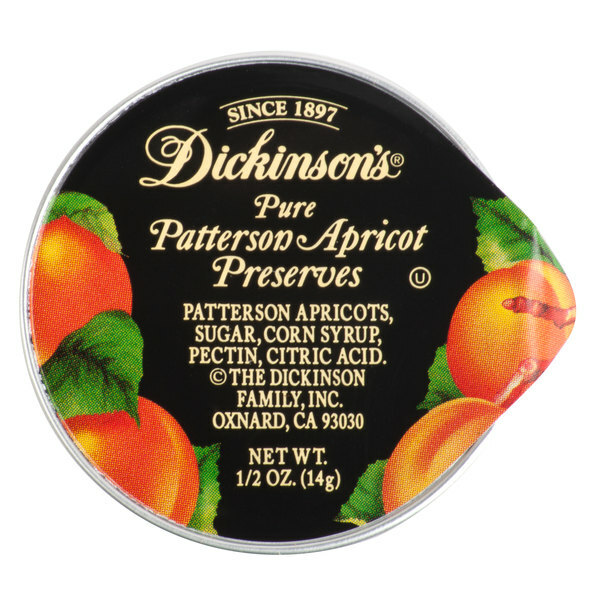 The Dickinson's pure Patterson Apricot Preserves are a winner. The portion cups are great for our catering events and everyone loves the fresh fruit flavor. These are great jams. We switched to these from the jars to save some cost. The jam is just as great as ever and we would recommend. The Dickinson's apricot preserves is excellent tasting and easy to open. It has a good consistency and the case count makes it inexpensive. Highly recommended! 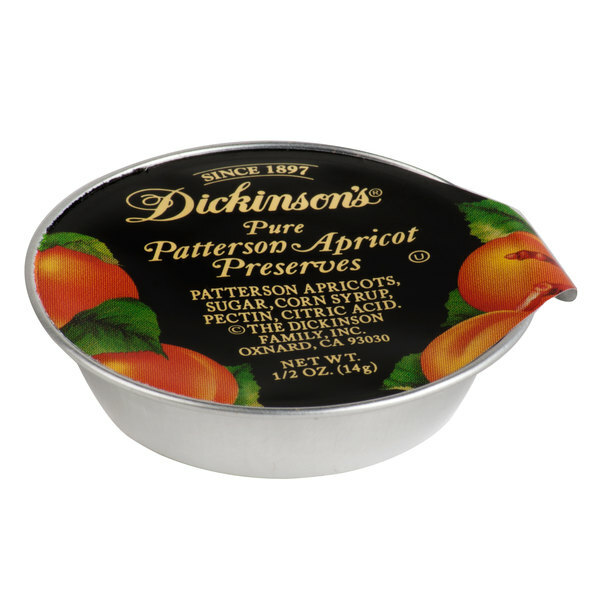 The Dickinson's pure Patterson apricot preserves are great. The portion cups are a nice feature and are great for our cafeteria. The apricot flavor is prominent unlike other brands. Very clean and fresh taste. Love that these come in little individual serving sizes which is perfect for spreading on toast or even a bagel. This is the floral and fruity taste of apricots in a spread. It is a good one. The disposable portion cups are a definite convenience.